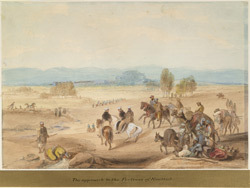 This sketch was made during the first Anglo-Afghan war of 1839-42 when Atkinson served as the official Superintending Surgeon of the Army of the Indus, a combined force of British and Indian troops. After struggling through the Bolan Pass, the army under Sir John Keane reached the plains near the town of Quetta, capital of the province of Baluchistan, in modern-day Pakistan. Mismanagement of supplies meant that the troops and followers were nearly in a state of mutiny over food. Atkinson wrote: "Here the state of the Army, for want of supply of grain and ollah became alarming, and although at this place abundant supplies had been promised and expected, it became necessary for the chief military authority, Sir Willoughby Cotton, to reduce the daily rations to one-half, which scanty allowance was continued for nearly three months." Lord Keane and his staff are portrayed in the foreground.